I was never one for the sugar-laden sweet potato casserole and truly, never understood it. That as a side dish and then pie for dessert? Made no sense to me, but traditions, I suppose. Even as a kid, I was never interested in that super sweet casserole, but honestly, it was probably more the sweet potato part that turned me off because I liked marshmallows, and brown sugar was okay in my book then too. 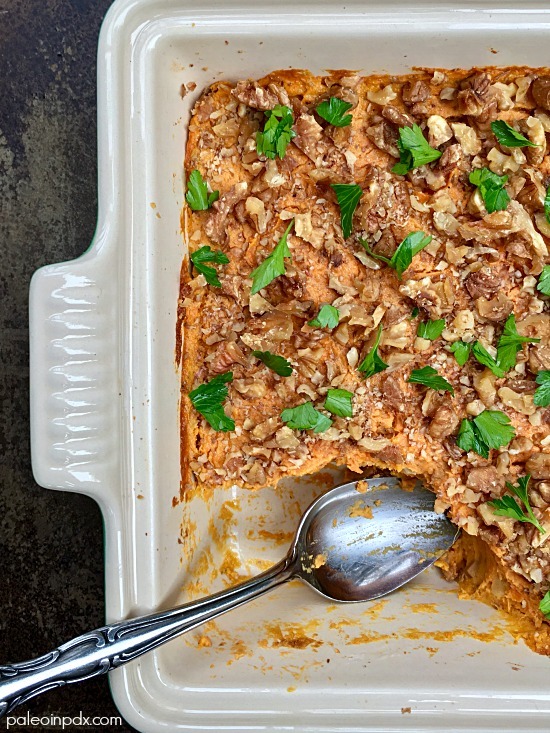 On the flip side, a savory sweet potato casserole is something I can totally get behind, and this one fits the bill. It has a nice mix of flavor and bite, plus some “cheesiness” from the nutritional yeast. If you’re not sure about the nutritional yeast, start with half the amount, taste, and add more if desired. Alternatively, you could use good-quality Parmesan cheese as a replacement, if tolerated and desired. Meanwhile, I wish all of you a happy Thanksgiving tomorrow! If any of you make this recipe to go with your holiday meal, please let me know how you like it! Preheat oven to 350 degrees F. Grease an 8×8 casserole dish with a little butter and set aside. Add sweet potato chunks to a large pot and add enough water to cover. Then, add a couple pinches of sea salt to the water. Bring to a boil over medium heat and cook until sweet potatoes are fork tender, about 6-8 minutes. Drain and set aside. In a large pan over medium heat, melt 2 Tbsp of the butter. Once melted, add the onion and sauté 1-2 minutes. Then, add the chanterelles and garlic. Season with a little sea salt and black pepper. Continue to cook until mushrooms are softened. Remove from heat and set aside. Add the remaining 1 Tbsp butter to the pot with the cooked sweet potatoes and mash. Then, add the nutritional yeast, onion granules or powder, cayenne, nutmeg, Dijon, vegetable broth, sea salt, and black pepper. Stir well. Taste and adjust seasoning as desired. Lastly, add the eggs and stir into mixture. Pour sweet potato mixture into the greased dish. Sprinkle walnuts on top in an even layer. Bake in preheated oven for 30-35 minutes.